When my son Jake proposed to his fiancé Susie, Jennifer and I had something in common with all of our clients; we had a big family wedding to look forward to. Jake is my oldest son and the first of his generation to get married, so it had been a while since we’d had a wedding. Susie was on top of every aspect of their planning. (Jake will be discouraged if I don’t say here that he was very insightful and helpful, and so I will.) 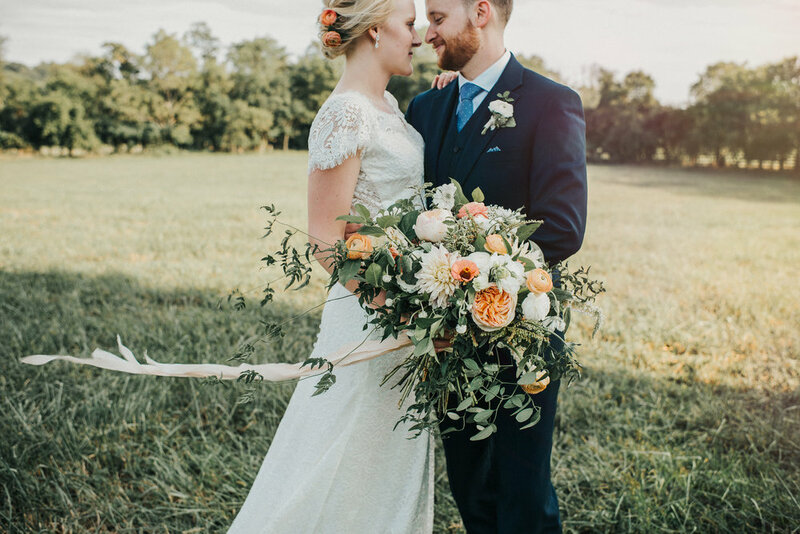 Like you, reader, she poured through Pinterest, wedding magazines and other web-sites to educate herself about all of the style and color choices possible for a couple planning a Fall wedding. With a beautiful venue in the Massachusetts countryside and a wedding scheduled during the “peak” of leaf turning, Susie and Jake decided to go all in on Fall. This meant a color palette that included vibrant shades of red, orange and yellow. Susie wanted to let the flowers and the countryside do all of the work. She found a deep, dark shade of charcoal gray for the bridesmaid dresses that complemented the flowers perfectly – a floral designers dream. The men wore light gray suits with red accent ties and boutonnieres. Did you know we are doing weddings in Massachuetts? Susie explains, “We wanted a barn wedding in a beautiful setting. The Barn at Gibbett Hill in Groton, Massachusetts is a once working barn completely renovated on the inside to be a little elegant, yet really comfortable, relaxed and fun. The lofted ceiling has beautiful rustic wood beams and chandeliers. It’s a classic red barn that becomes a beautiful backdrop behind the ceremony site.” There are also cows living on the property who often graze on the hill during ceremonies. Some of the unique florals from Susie's bouquet. The ceremony setting faces a small pond and pastured hillside, so Susie and Jake wanted to use fairly simple ceremony décor. Susie recalls, “I found the ombre petals for the ceremony in a photo of another J. Morris wedding and thought that it would be pretty to separate our colors of the day. But, I really left that up to Jennifer and Katie.” The other ceremony element - Northern Virginia style wine barrels. Last year, Jake and Susie moved to Silver Spring, Maryland to take jobs in the area. Of course, we made sure that they spent some time at the Virginia wineries. Susie loved the look of the wine barrels so easily accessible to us. To get that look in Massachusetts, she had to rent them for the day. Jennifer designed arrangements that were very full, and yet, three sided, so that we could bring them in to the reception space and set them on two of the accent tables. We love the little touches that brides add to their wedding décor. Susie and Jake had a welcome sign and seating chart made from barn-wood siding. Jennifer created a bay leaf garland as a natural frame and added a few of the focal flowers. Katie added some accent arrangements around to the gift table and added greens and a re-purposed ceremony arrangement to the ladder that held their caramel popcorn favors. J. Morris Flowers had created tree bases for a Spring wedding designed to mimic the flowering trees of Northern Virginia and DC. Jennifer mentioned the idea of using tall tree-like centerpieces at “The Barn” to help fill some of the loftiness of the beautiful vaulted barn ceiling. “Jake and I loved the idea of taking our fondness for fall and its foliage one step further by adding trees to the décor. They worked really well with our low centerpieces, wooden boxes that paired well with the burlap textured linens we had selected. To create the bases for trees that look like the hardwoods native to Massachusetts, we needed to start over. My husband, Evan, and I, used large sections of fallen branches with interesting natural features like knots and lichen. We cut them to exact dimensions, then attached them to larger wood slabs available from Accent Décor. The florals were designed to sit on a smaller wood slab with lots of greenery, mimicking the fullness of a tree. The rehearsal dinner was held on site in the Grille at Gibbett Hill. They have a beautiful upstairs room with a fireplace and long farm tables for special events. Katie and I wanted to be careful not to use the colors of the wedding day, saving that for the guests to see for the first time upon arrival. We chose a more muted palette that included the peachy-pink of Café Au Lait Dahlias and the warm green of Bay Leaf in long garlands. We added a favorite vase from Accent Décor and some art deco style lanterns for the fireplace.